"This is a very versatile Italian sausage which can be used in many different ways. You can take it from mild to hot and it's very easy to use. 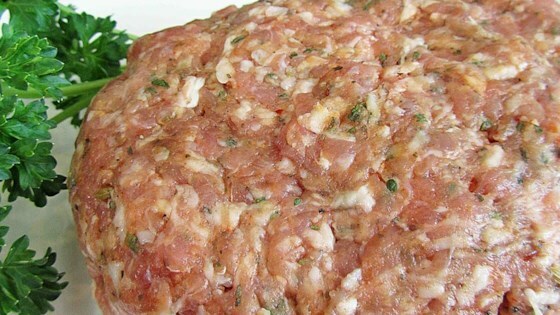 There are also different options for type of meat to use, like ground chuck or ground turkey (do not use ground beef). If using ground turkey, you'll have to coat your skillet with a little olive or veggie oil before cooking as it has very little fat and will stick to skillet." Place the pork and red wine vinegar in a mixing bowl. Sprinkle with salt, black pepper, parsley, garlic powder, onion powder, basil, paprika, red pepper flakes, fennel seed, brown sugar, oregano, and thyme. Knead until flecks of spice are evenly distributed through the sausage. Divide the sausage into thirds, and form into 3 logs; wrap each in plastic wrap. Place wrapped sausage into a freezer bag before freezing, or store in refrigerator for at least 12 hours before cooking. I always wrap first and then put into a freezer bag or plastic container to help prevent freezer burn. For easy patties, pull log out of freezer and thaw. You can use a finely serrated knife to cut right through wrapping into 1/4 to 1/2 inch slices, or use the same as you would ground chuck as meat product. I use it for patties, spaghetti meat, meatballs, etc.